The London author Michael Rosen has been the poet laureate of the UK. He knows poetry. What is Poetry? The Essential Guide to Reading and Writing uses many famous poems to illustrate certain points. The first chapter has 70 pages and eleven famous poems in it, with Rosen making ten points about the poems. That’s a lot to digest in one chapter. It all falls under the chapter heading called What is Poetry? As a reference book, What is Poetry? is lacking logical organization and a complete table of contents. As a book to read cover to cover, it is interesting if a bit difficult, especially while analyzing the writings of Dickinson, Robert Louis Stevenson, Alfred Lord Tennyson, Elizabeth Barrett Browning and her husband Robert, Shelley, Shakespeare, and Edward Lear—all in chapter one. As the book goes on, Chapter Two covers What Can You Do with a Poem? My Thoughts As I was Writing some Poems, Ways to Start a Poem, Writing Poems, etc. The book is less useful as a guide and more useful as a study of Michael Rosen’s organizational skills. At least there is an index if one cares to look up limericks or haikus. Never mind haikus. There are none in the book to be found. Chapter Three, My Thought As I was Writing Some Poems, is interesting as Rosen explains how his poems evolved. Chapter Four tells Ways to Start a Poem, including Daydream, Keep a Notebook, Make Lists, Pretend You’re Someone Else, Pick a Moment (which has many subcategories: personal, from stories, conversations, picture, dreams, fantasies, nonsense), and Celebrate your Culture (its subcategories are home, food, sayings, games, festivals). Chapter Five discusses writing poems. The categories are Talk with your Pen, Less is More, Impossible Writing, the Chorus, Call and Response, Question and Answer, Imagism, Symbolism, Long and Short, Volcano page, and Things to Do with your Poems (with a bunch of subcategories that could have been its own chapter). The strength of the book lies in Chapter Six: Some Technical Points About Poems. 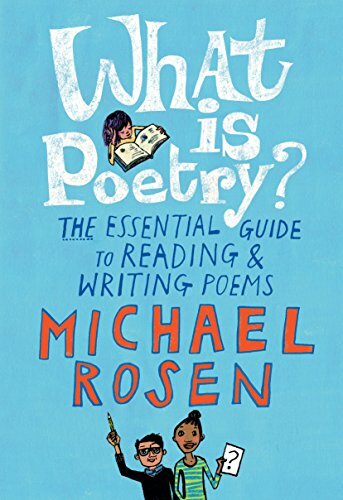 Here Rosen discusses stressed beats, iambic pentameter, blank verse, free verse, rhyme scheme, half rhyme, internal rhyme, alliteration, assonance, metaphor and simile, metonymy, personification, persona, and allusion. The reader will get her money’s worth on this chapter. When Rosen uses his own poems as examples, things are clearer, since his poems are simpler than the aforementioned poets’. He shows how to evoke feeling with words. His poem “Today: One Day” was based on an old photo from World War II. It would have been nice if the photo had been included in the book. None of the subcategories are listed in the table of contents, so without skimming the whole book, it is impossible to know what the chapters contain. Michael Rosen is probably a brilliant poet. He is less brilliant at laying out a book that is easy to use as a reference guide. The reader will likely get bogged down with the eleven poems in chapter one, which are the hardest to dissect and understand. They should’ve come later in the book after the different terms had been introduced. That would give the reader time to work up to the more difficult poetry. The book would be a hard read for a child younger than 4th grade. It would be ideal to have a class set where a teacher can lead the way and possibly rearrange the teaching order of the chapters. Overall, What is Poetry? has value and insight. It has no conclusion, just five blank pages for the reader to fill in. Perhaps an essay exam upon conclusion of the book? Other poets studied are Isaac Watts, Lewis Carroll, Thomas Hardy, Rudyard Kipling, Coleridge, Banjo Paterson, and Christina Rossetti. It’s kind of like getting your BA in English, but for kids (very sophisticated ones). Every English teacher and ambitious upper-grade elementary school teacher needs this book. Just read Chapter One last, and you’ll be all set.